Simple guide on How to Jailbreak iOS 9.1 untethered for iPhone 7,6,6s Plus,iPad Air,iPad Pro,iPad mini 4 3 2 on Windows 10/8/7 Mac via Pangu. As we have previously introduced the availability of untethered iOS 9.1 Jailbreak download via Pangu for 64 bit iOS devices, here’s an in-depth step-by-step guide on how to jailbreak iOS 9.1 untethered for iPhone 6s, iPhone 6s Plus, iPhone 6, iPhone 6 Plus, iPhone 5s, iPad Air 2, iPad Air, iPad mini 4, iPad mini 3, iPad mini 2, iPad Pro and iPod Touch 6 on Windows 10/8/7 and Mac. As we have stated earlier in both posts, this particular iOS 9.1 jailbreak by Pangu9 will not support the following devices: iPhone 5c, iPhone 5, iPhone 4s, iPad 3, 2, 1, iPad Mini 1, iPod Touch 5 or anything else older. For those of you who chose to patiently stick with iOS 9.1 for so long should be very excited as this could be the biggest reward for your patience of not upgrading your device. It’s worth mentioning that downgrading iOS 9.2.1 or iOS 9.3 to iOS 9.1 is no longer possible as Apple has stopped signing for iOS 9.1 long ago. Here’s a list of preparation and requirements of several items before beginning to jailbreak your iOS 9.1 device. As we have mentioned above, 64 bit iOS devices are the only device supported by Pangu9 iOS 9.1 Jailbreak tool as of now. Don’t attempt to jailbreak unsupported device as you may risk bricking your device. iPhone, iPad or iPod Touch running iOS 9.1. Latest version of iTunes (Download from Apple website). Step 1: Backup all your data, photos, videos and files with whichever method you prefer. Best with iTunes and iCloud syncing. Step 2: Launch iTunes on your PC or Mac computer. Connect your iPhone or iPad to your computer. Step 3: Turn on Airplane Mode. And then, turn off Find My iPhone feature by going to Settings, iCloud, Find My iPhone. 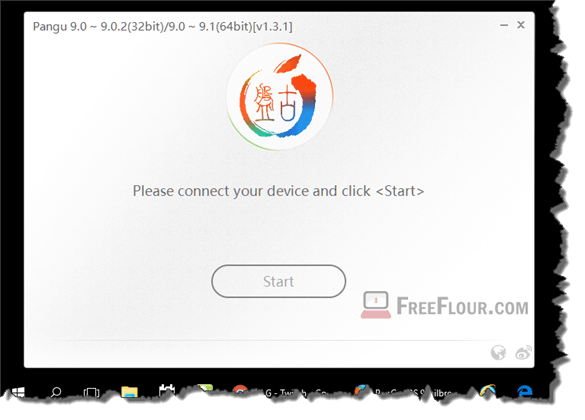 This step is important to make sure nothing will interfere while the jailbreak is in progress. Step 4: Turn off Passcode and Touch ID unlock by going to Settings, Touch ID and Passcode and tap on Turn Passcode Off. Step 5: Launch the downloaded Pangu9 iOS 9.1 Jailbreak Tool. Step 6: Click on the Start button to begin. Click “Already Backup” when asked. It will then start the jailbreak process automatically. During the process, do not disconnect your device from the computer. Leave it untouched til the next step. It’s normal for a Pangu9 logo to show up on your iPhone. Step 7: Wait for your device to reboot. Eventually, it will reboot automatically. Once restarted, Pangu will ask you to turn on Airplane mode again. Do so and the jailbreak process will continue automatically. Step 8: Next, Pangu9 will ask you to run Pangu app on your device. Do so and wait for the remaining jailbreak to finish. Once done, Pangu9 will show a jailbreak completed status message. You can then find Cydia on your device on your home screen. That’s all for it! Update 1: iOS 9.3 has just been released. Do not update to iOS 9.3 if you are the lucky one who are still using iOS 9.1 as there is currently no jailbreak available for iOS 9.3 yet.